We primarily print others’ designs, meaning we specialize in problem-solving, combining processes, and timely fulfillment. Finding the right partner for production is important, and that’s why we offer a trade discount for designers and stationers who are looking to pair with us for their printing needs. We’ll also send examples of the finished product to the designer if we’re drop-shipping to the client. Check out Services to see what we can do for you. Turnaround is usually ten to 15 working days. Rush printing sometimes available as well. Files should be .ai or .pdf files with all type converted to vectors, and art vectorized or embedded as high-res .tifs. Contact us for help or if you have questions. Inks are mixed to match by hand according to the Pantone solid uncoated system. We can use both metallic and neon inks for no additional charge. 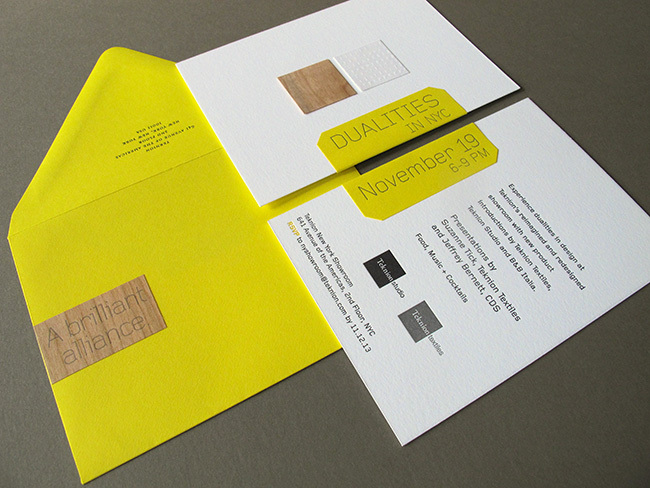 Yes, we can often combine digital or offset-printing with letterpress. Papers are usually cotton, but we can use any paper you’d prefer, including a wide variety of specialty (e.g., suede-touch) stocks. Largest sheet size we can handle is about 10×15, but we can sometimes work out a larger sheet, depending on the art. Payment may be made via credit card, check, or PayPal. 50% is due to start work with the balance due when the job is ready to ship. Shipping is usually via UPS Carbon Neutral; contact us for other methods.